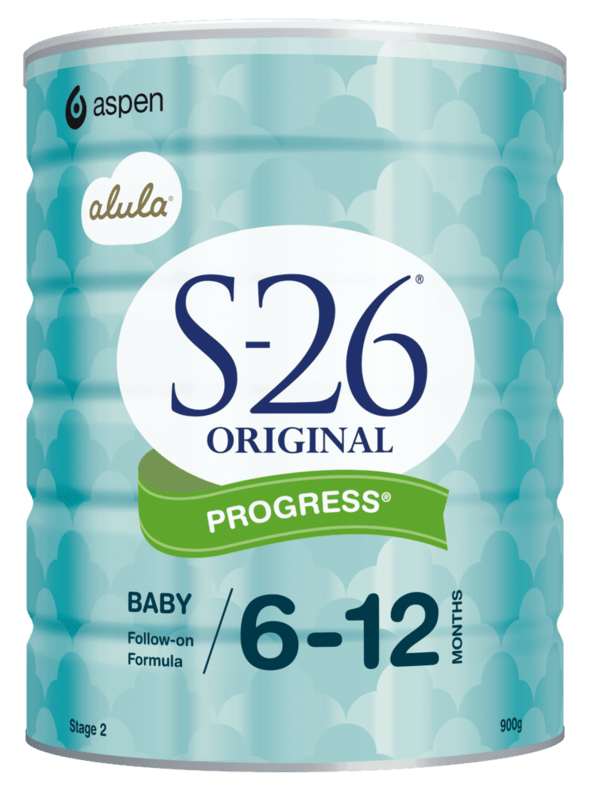 S-26 ORIGINAL PROGRESS is a follow-on formula designed to provide balanced nutrition suitable for babies from 6 months when solids are being introduced. From 6 months of age when solids are being introduced, our specially developed follow-on formula S-26 ORIGINAL PROGRESS provides balanced nutrition. This is a very active time for your growing baby who will soon be sitting, crawling, standing and may even be saying a little word or two – just some of the milestones to look forward to during this important developmental phase of your baby’s life. S-26 Original Progress is made in Mexico. Your baby may need more or less than indicated. Ideally, formula should be prepared just prior to feeding. Otherwise, refrigerate prepared formula and use within 24 hours. Not to be used for infants under 6 months. From 6 months, infants should be offered solid food in addition to this formula. Milk solids, lactose, vegetable oils (including soybean), emulsifier (soy lecithin), acidity regulator (lactic acid), taurine, nucleotides (cytidine-5′-monophosphate, disodium uridine-5′ monophosphate, adenosine-5′-monophosphate, disodium inosine-5′-monophosphate, disodium guanosine-5′-monophosphate), L-cysteine, antioxidants (mixed tocopherols concentrate, ascorbyl palmitate). Minerals: Calcium, potassium, sodium, chloride, phosphorus, magnesium, iron, zinc, copper, manganese, iodine, selenium. Vitamins: Vitamin C, niacin, vitamin E, vitamin A, vitamin B1, pantothenic acid, vitamin B6, vitamin B2, beta-carotene, folic acid, vitamin K, vitamin D, biotin, vitamin B12. The protein source of S-26 ORIGINAL PROGRESS Follow-On Formula is cow’s milk.